Romdeng restaurant in Phnom Pehn is a perfect spot to try the Cambodian famous deep,fried tarantulas and dipping sauce. 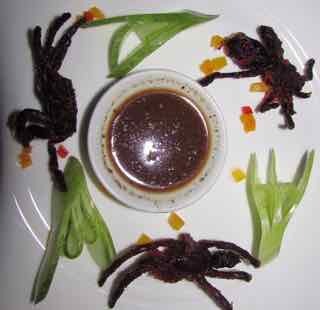 The spicy peppery sauce is wonderful and the spiders are crispy and tasty. The legs are not tough reminded me of well cooked pork crackling. The body is soft and creamy and reminded me of smoked tinned oysters. Mmm…this sounds great. I really liked locusts in Vietnam. I haven’t tried locusts but these were pretty good or at least the dipping sauce was!